Steam Integration is Coming! How Will it Work? How Will Steam Integration Work? In about a week we'll submit Project: Gorgon for final approval to Steam and it should be for sale as a Steam Early Access game in about two weeks. So what exactly will this mean for you? Currently, the game is in alpha. Alpha is the earliest development stage, where we prototype game ideas, iterate on the core design, and make sure we're on a solid technical footing. When we launch on Steam Early Access, alpha development officially ends and beta development begins. This is just an internal milestone indicating that we'll be focusing more on fleshing out, optimizing, balancing, and extending the game. We'll continue to roll out game updates every couple of weeks, as always. The game has been completely free to play during alpha. During beta, you will need to play the game through Steam, meaning you need to own a Steam license for the game. The only immediate change for players is that you'll need to play the game through Steam. If you pre-purchased the game, we'll email your Steam key(s) to you after the game is live on Steam. Our email will include instructions on how to redeem your Steam key, although it's very simple: you install Steam and then you choose a menu option to redeem the key. Then you download the game through Steam and play. If you haven't pre-purchased the game, you obviously won't be emailed a Steam key. Just buy the game in the Steam store and play! For about two weeks after the game is available on Steam, you'll still be able to log in with the current alpha launcher, using your alpha username and password just like you do today. This short grace period is important because it will take a few days to email out all the pre-ordered Steam keys, and to deal with any hiccups or problems. If you can't buy the game right now, or don't want to buy it until it's officially launched, don't worry about your existing characters: they'll still be here when you finally purchase the game. When you run the game through Steam for the first time, the game will ask you if you have an alpha account. (If you've played the game before, you do! That's your current game account.) You'll then be prompted to enter your alpha account name and password, the same ones you use to login to the game today. Your Steam account will then be connected to your alpha account, so you can access your existing characters through Steam. After that, you won't need to enter your alpha username and password anymore. Whenever you start the game from Steam, you'll be automatically logged in. We aren't yet rolling out any of the pre-order benefits (such as horses, titles, special items, or VIP features). Some of those features are still a long way off, while others will be coming soon. But before we roll out anything, we want to make sure we've got your data right. 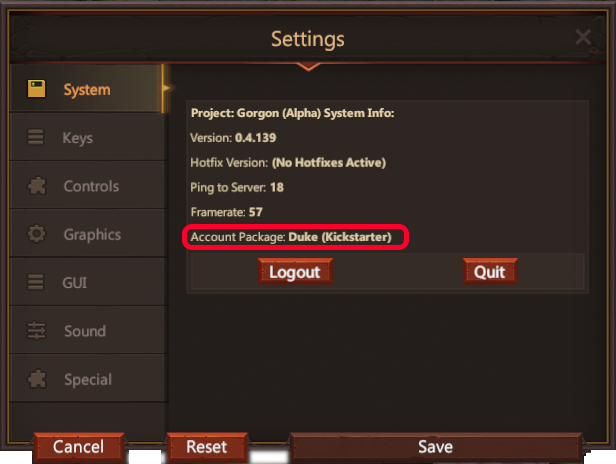 If you backed us through Kickstarter or Indiegogo, you'll be able to see a message in-game showing which package you bought. That way, if there are any problems or errors, you can let us know early so we can address them. If you bought a package through the Gorgon Shop, we'll email you asking for your alpha account name and other info needed to fulfill your package. After we assign that info to your account, you'll see a message in-game confirming that you've got the right package. When your account's pre-order package is set up, you'll see a message on the Settings screen here. We've mentioned before that we'll be doing a partial wipe of character data when the game finally launches. (We won't be wiping your skill levels, but we will be deleting all items and money, aside from unique backer-reward items.) That's to help our game economy work better at launch time. BUT!!! That's not happening any time soon! We're doing the partial wipe when the game officially launches at the end of 2018. Right now we're just switching from alpha to beta. Your characters will be entirely unchanged. Previously I'd said that the initial rollout on Steam would only be for Windows and Mac, and that Linux users would be unable to play for a while until the Linux version was ready. That's dumb and we aren't going to do that. Instead, we just delayed the Steam launch until it was ready on all three platforms. So when the game is for sale on Steam, it will be for sale for Windows, Mac, and Linux. We've been working hard to make this a painless transition to Steam. There may be surprises or problems, but we have backup plans for every contingency. If something goes wrong, don't worry. We'll be able to fix it. So that's the plan. Expect an email from us in a few weeks with your codes. And thank you again for being an alpha tester. PS - We'll have another game update ready in a few days with bug-fixes, performance improvements, new-player improvements, and more.